Japanese encephalitis (JE) virus is a single-stranded RNA virus that belongs to the genus Flavivirus and is closely related to West Nile and Saint Louis encephalitis viruses. JE virus is transmitted to humans through the bite of an infected mosquito, primarily Culex species. The virus is maintained in an enzootic cycle between mosquitoes and amplifying vertebrate hosts, primarily pigs and wading birds. Humans are incidental or dead-end hosts, because they usually do not develop a level or duration of viremia sufficient to infect mosquitoes. 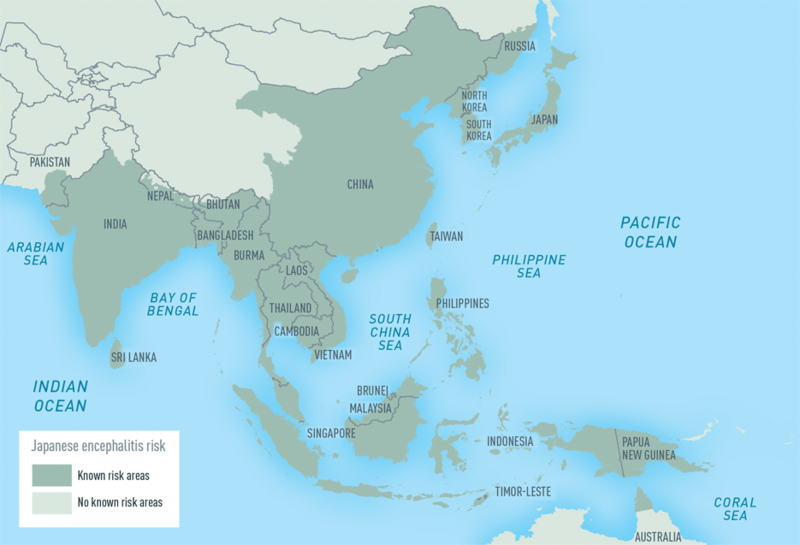 JE virus is the most common vaccine-preventable cause of encephalitis in Asia, occurring throughout most of Asia and parts of the western Pacific (Map 3-08). Local transmission of JE virus has not been detected in Africa, Europe, or the Americas. Transmission principally occurs in rural agricultural areas, often associated with rice cultivation and flood irrigation. In some areas of Asia, these ecologic conditions may occur near, or occasionally within, urban centers. In temperate areas of Asia, transmission is seasonal, and human disease usually peaks in summer and fall. In the subtropics and tropics, seasonal transmission varies with monsoon rains and irrigation practices and may be prolonged or even occur year-round. In endemic countries, where adults have acquired immunity through natural infection, JE is primarily a disease of children. However, travel-associated JE can occur among people of any age. For most travelers to Asia, the risk for JE is extremely low but varies based on destination, duration, season, and activities. From 1973 through 2015, 79 JE cases among travelers or expatriates from nonendemic countries were published or reported to CDC. From the time a JE vaccine became available in the United States in 1993, through 2015, only 10 JE cases among US travelers were reported to CDC. The overall incidence of JE among people from nonendemic countries traveling to Asia is estimated to be <1 case per 1 million travelers. However, expatriates and travelers who stay for prolonged periods in rural areas with active JE virus transmission are likely at similar risk as the susceptible resident population (5–50 cases per 100,000 children per year). Travelers on even brief trips might be at increased risk if they have extensive outdoor or nighttime exposure in rural areas during periods of active transmission. Short-term (<1 month) travelers whose visits are restricted to major urban areas are at minimal risk for JE. In some endemic areas, although there are few human cases among residents because of natural immunity among older people or vaccination, JE virus is still maintained locally in an enzootic cycle between animals and mosquitoes. Therefore, susceptible visitors may be at risk for infection. Most human infections with JE virus are asymptomatic; <1% of people infected with JE virus develop clinical disease. Acute encephalitis is the most commonly recognized clinical manifestation of JE virus infection. Milder forms of disease, such as aseptic meningitis or undifferentiated febrile illness, can also occur. The incubation period is 5– 15 days. Illness usually begins with sudden onset of fever, headache, and vomiting. Mental status changes, focal neurologic deficits, generalized weakness, and movement disorders may develop over the next few days. The classical description of JE includes a parkinsonian syndrome with mask-like facies, tremor, cogwheel rigidity, and choreoathetoid movements. Acute flaccid paralysis, with clinical and pathological features similar to those of poliomyelitis, has also been associated with JE virus infection. Seizures are common, especially among children. The case-fatality ratio is approximately 20%–30%. Among survivors, 30%–50% have serious neurologic, cognitive, or psychiatric sequelae. Common clinical laboratory findings include moderate leukocytosis, mild anemia, and hyponatremia. Cerebrospinal fluid (CSF) typically has a mild to moderate pleocytosis with a lymphocytic predominance, slightly elevated protein, and normal ratio of CSF to plasma glucose. JE should be suspected in a patient with evidence of a neurologic infection (such as encephalitis, meningitis, or acute flaccid paralysis) who has recently traveled to or resided in an endemic country in Asia or the western Pacific. Laboratory diagnosis of JE virus infection should be performed by using a JE virus–specific IgM-capture ELISA on CSF or serum. JE virus–specific IgM can be measured in the CSF of most patients by 4 days after onset of symptoms and in serum by 7 days after onset. Plaque reduction neutralization tests can be performed to confirm the presence of JE virus–specific neutralizing antibodies and discriminate between cross-reacting antibodies from closely related flaviviruses (such as dengue and West Nile viruses). A ≥4-fold rise in JE virus– specific neutralizing antibodies between acute-and convalescent-phase serum specimens may be used to confirm recent infection. Vaccination history, date of onset of symptoms, and information regarding other flaviviruses known to circulate in the geographic area that may cross-react in serologic assays need to be considered when interpreting results. Humans have low levels of transient viremia and usually have neutralizing antibodies by the time distinctive clinical symptoms are recognized. Virus isolation and nucleic-acid amplification tests are insensitive in detecting JE virus or viral RNA in blood or CSF and should not be used for ruling out a diagnosis of JE. Clinicians should contact their state or local health department or CDC at 970-221-6400 for assistance with diagnostic testing. The best way to prevent mosquitoborne diseases, including JE, is to avoid mosquito bites (see Chapter 2, Protection against Mosquitoes, Ticks, & Other Arthropods). One JE vaccine is licensed and available in the United States—an inactivated Vero cell culture– derived vaccine, Ixiaro (Table 3-06). Ixiaro is manufactured by Valneva Scotland Limited and distributed in the United States by VaxServe (a Sanofi Pasteur company). It was approved in March 2009 for use in people aged ≥17 years and in May 2013 for use in children aged 2 months through 16 years. Other inactivated and live attenuated JE vaccines are manufactured and used in other countries but are not licensed for use in the United States. When making recommendations regarding the use of JE vaccine for travelers, clinicians must weigh the overall low risk of travel-associated JE, the high rate of death and disability when JE occurs, the low probability of serious adverse events after immunization, and the cost of the vaccine. Evaluation of a traveler’s risk should take into account the planned itinerary, including travel location, duration, activities, and seasonal patterns of disease in the areas to be visited (Table 3-07). The data in the table should be interpreted cautiously, because JE virus transmission activity varies within countries and from year to year. Short-term (<1 month) travelers to endemic areas during the JE virus transmission season, if they plan to travel outside an urban area and their activities will increase the risk of JE virus exposure. Examples of higher-risk activities or itineraries include 1) spending substantial time outdoors in rural or agricultural areas, especially during the evening or night; 2) participating in extensive outdoor activities (such as camping, hiking, trekking, biking, fishing, hunting, or farming); and 3) staying in accommodations without air conditioning, screens, or bed nets. There are no efficacy data for Ixiaro. The vaccine was licensed in the United States on the basis of its ability to induce JE virus neutralizing antibodies as a surrogate for protection, as well as safety evaluations in almost 5,000 adults. In pivotal immunogenicity studies, 96% of adults and 100% of children aged 2 months through 17 years developed protective neutralizing antibodies at 28 days after receiving a primary immunization series of 2 doses administered 28 days apart. Among adults aged ≥65 years, 65% are seroprotected at 42 days after the 2-dose primary series. A study in adults on persistence of protective neutralizing antibodies after a primary 2-dose series of Ixiaro showed that at 5 years postvaccination, 82% of subjects were seroprotected. However, the study was conducted in areas where tickborne encephalitis (TBE) vaccine is available. In a subgroup analysis, seroprotection rates at 24– 60 months in the TBE vaccine group ranged from 94%–100%, compared with 64%–72% in the group in which TBE vaccine was not administered. TBE vaccine is not available in the United States; therefore, JE seroprotection rates for US travelers are likely to be most similar to the rates in the group not administered TBE vaccine. One observational study investigated long-term protection following a booster dose of Ixiaro in adults. After a booster dose administered at 15 months, 96% of subjects were still seroprotected approximately 6 years later. There are limited data on duration of seroprotection and need for a booster dose in children. In a study conducted among children from non-endemic countries, 89% were seroprotected at 3 years after a primary 2-dose series of Ixiaro. This rate was higher than that in a comparative adult study. In a study conducted among children in a JE-endemic country, 90% of children were seroprotected at 36 months after the primary series. Seroprotection rates were variable by age group, but at least 81% of children in each age group were seroprotected. An accelerated primary series of 2 doses of Ixiaro administered 7 days apart has been studied in adults aged 18–65 years. In the accelerated schedule group, 99% of adults were seroprotected, compared with 100% of adults in the standard schedule group. The accelerated primary series was noninferior to the conventional dosing schedule. An accelerated schedule (administered on days 0 and 7) has been licensed for use in Europe. The primary immunization schedule for Ixiaro is 2 doses administered intramuscularly on days 0 and 28 (Table 3-6). For children aged 2 months through 2 years, each dose is 0.25 mL, and for adults and children aged ≥3 years, each dose is 0.5 mL. To administer a 0.25-mL dose, health care providers must expel and discard half of the volume from the 0.5-mL prefilled syringe by pushing the plunger stopper up to the edge of the red line on the syringe barrel before injection. The 2-dose series should be completed ≥1 week before travel. For adults, if the primary series of Ixiaro was administered >1 year previously, a booster dose should be given before potential reexposure or if there is a continued risk for JE virus infection. Data on the response to a booster dose administered ≥2 years after the primary series are not available. There are limited data on the use of Ixiaro as a booster dose after a primary series with the mouse brain–derived inactivated JE vaccine. Two studies have been conducted, 1 in US military personnel and the other at 2 travel clinics in Europe. Both studies demonstrated that in adults who had previously received at least a primary series of mouse brain–derived inactivated JE vaccine, a single dose of Ixiaro adequately boosted neutralizing antibody levels and provided at least short-term protection. In addition, seroprotective titers against both vaccine virus strains persisted in all participants who could be followed up at 2 years in the European study (N = 18). However, additional data are needed on the duration of protection after a single dose of Ixiaro in prior recipients of a mouse brain–derived vaccine. Until those data are available, people who have received JEVax, the mouse brain–derived vaccine formerly used in the United States, and require further vaccination against JE virus, should receive a 2-dose primary series of Ixiaro. Local symptoms of pain and tenderness were the most commonly reported symptoms in a safety study with 1,993 adult participants who received 2 doses of Ixiaro. Headache, myalgia, fatigue, and an influenzalike illness were each reported at a rate of >10%. In children, fever was the most commonly reported systemic reaction in studies. A severe allergic reaction after a previous dose of Ixiaro or any other JE vaccine, or to any component of Ixiaro, is a contraindication to administration of Ixiaro. Ixiaro contains protamine sulfate, a compound known to cause hypersensitivity reactions in some people. No studies of Ixiaro in pregnant women have been conducted. Therefore, administration of Ixiaro to pregnant women usually should be deferred. However, pregnant women who must travel to an area where risk for JE virus infection is high should be vaccinated when the theoretical risk of immunization is outweighed by the risk of infection. 1If potential for JE virus exposure continues. Thailand Endemic countrywide; seasonal epidemics in the northern provinces Year-round with peak season May–October, especially in the north Highest rates of human disease reported from the Chiang Mai Valley; several cases reported recently in travelers who visited resort or coastal areas of southern Thailand. 1Data are based on published reports and personal correspondence. Risk assessments should be performed cautiously, because risk can vary within areas and from year to year, and surveillance data regarding human cases and JE virus transmission are incomplete. 2In some endemic areas, human cases among residents are limited because of natural immunity among older people or vaccination. However, because JE virus is maintained in an enzootic cycle between animals and mosquitoes, susceptible visitors to these areas still may be at risk for infection. CDC. Recommendations for use of a booster dose of inactivated Vero cell culture-derived Japanese encephalitis vaccine: advisory committee on immunization practices, 2011. MMWR Morb Mortal Wkly Rep. 2011 May 27;60(20):661–3. Fischer M, Lindsey N, Staples JE, Hills S. Japanese encephalitis vaccines: recommendations of the Advisory Committee on Immunization Practices (ACIP). MMWR Recomm Rep. 2010 Mar 12;59(Rr-1):1–27. Jelinek T, Burchard GD, Dieckmann S, Buhler S, Paulke-Korinek M, Nothdurft HD, et al. Short-Term immunogenicity and safety of an accelerated preexposure prophylaxis regimen with Japanese encephalitis vaccine in combination with a rabies vaccine: a phase III, multicenter, observer-blind study. J Travel Med. 2015 Jul-Aug;22(4):225–31. Paulke-Korinek M, Kollaritsch H, Kundi M, Zwazl I, Seidl-Friedrich C, Jelinek T. Persistence of antibodies six years after booster vaccination with inactivated vaccine against Japanese encephalitis. Vaccine. 2015 Jul 9;33(30):3600–4. Rabe IB, Miller ER, Fischer M, Hills SL. Adverse events following vaccination with an inactivated, Vero cell culture-derived Japanese encephalitis vaccine in the United States, 2009–2012. Vaccine. 2015 Jan 29;33(5):708–12. Schuller E, Klingler A, Dubischar-Kastner K, Dewasthaly S, Muller Z. Safety profile of the Vero cell-derived Japanese encephalitis virus (JEV) vaccine IXIARO((R)). Vaccine. 2011 Nov 3;29(47):8669–76. Tauber E, Kollaritsch H, von Sonnenburg F, Lademann M, Jilma B, Firbas C, et al. Randomized, double-blind, placebo-controlled phase 3 trial of the safety and tolerability of IC51, an inactivated Japanese encephalitis vaccine. J Infect Dis. 2008 Aug 15;198(4):493–9.